The mater is made of two soldered layers of brass, one for the plate and the other for the rim and the throne. The face of the limb is divided into 12 hours, numbered I to XII twice, each subdivided into 12 parts. The rim of the limb is engraved with the names of the cardinal points 'OCCIDENS' 'SEPTENT' and 'ORIENS', as well as 'HORE EQUALES'. The inner part of the mater is engraved with an east-west line (marked 'ORIZON RECTVS') and meridian line. The equator is indicated 'EQNOCTIAL<IS>' and the tropics are marked 'TROPI CAPCOR' and 'TROPI CACRI' with their symbols. The meridian is indicated 'ME RECT<US>'. The horizon lines are engraved and numbered from 10 to 90 by 10. The ring and shackle are missing, and the throne is made of three Tudor roses supported on a foliate scroll. The rete is reduced to the ecliptic band, divided into 360?, to 5? and to 1?, numbered from [0?] to 30? by 10?. The zodiac signs are named and accompanied by the symbols of their associated planets. 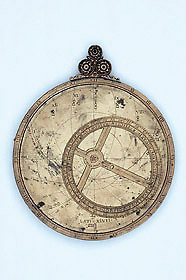 The meridian and east-west band meet on a circle inscribed 'ALRUKABA' and 'STELLA POLA', with a star engraved. On the meridian band is also inscribed 'POL ZOD'. The two plates are engraved with both tropic and equator lines, astrological houses marked 'DO' or 'DOMVS', with the Roman numerals, and unequal hour lines marked 'HOR INEQA 1'...'HOR INEQA 12'. The horizon line is dotted and marked 'ORI' 'OBL'. The plates are marked with the latitude on the notch. The first plate is marked 'LATI XLV', and its back is for 'LATI XLVII'. The second plate is engraved for 'LATI XLVIIII' and its back for 'LATI LI'. The back of the mater is engraved in four quadrants of 90?, with 90? at the zenith, divided to 5? and to 1?, numbered by 10?. Concentric to this is a zodiac scale, sharing the division with the scale of degrees, numbered from  to 30 by 10 and with the names of the zodiac signs. Further to the centre is a calendar scale divided into days to 5 and to 2, with the names of the months and the 10th, 20th and last day of the month numbered. The first point of Aries corresponds to the 10th of March. Next to the centre is, on the bottom half, a double shadow square marked 'VMBRA RECTA' and 'VMBRA VERSA', divided to 3 and to 1, and numbered by 3 only on two sides. At the bottom of the shadow square is the signature 'PER IOHANNEM WAGNER NORIMBERG M DXXXVIII'. On the top half of the mater plate is a coat-of arms with a mace between two five-petalled flowers and a star, quartering a colt rampant and a crescent. On the sides of the coat-of-arms are the initials 'R R' and unequal hour lines numbered 1 to 12. The alidade is counterchanged and inscribed 'ALHIDADA ID' and 'LINEA FIDUCIEI'. It is fitted with large folding sights, each with ornamented edges and two pin holes. The pin, decorated with a star, is kept by another split pin. See R. T. Gunther, The Astrolabes of the World (2 vols, Oxford, 1932), vol. 2, p. 434.